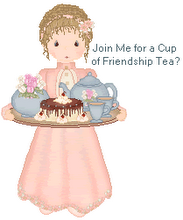 Friendship Tea: Chaos or Organized? posting these photos of one of my favorite rooms in our house. It's normally an orderly, and comfortable tea-themed guest room. for moving into the dorm at Transylvania University later this month. are a lot of changes from the days I lived on a college campus. and colors with my roommate. Boys don't care what they take or if the colors clash. to arrive on move-in day, and I hope a lot more detailed information. In the meantime, please bear with me as I'm spending very little time blogging. How well I remember that organized chaos! Enjoy every moment of it, he'll be moved into that dorm in the blink of an eye. This did bring back memories of dorm life. Wow! what excitement and anticipation. I don't remember coordinating with a roommate, but maybe we did. I do remember I took very little, I think one suitcase for clothes and the other for bedding and towels. How exciting for Austin! Looks like you're getting it all pulled together! Excitement is in the air! Good Luck, Austin! Still can't believe Austin is starting college! Here's hoping it's a pleasant and calm (well, as calm as can be expected) experience for all!